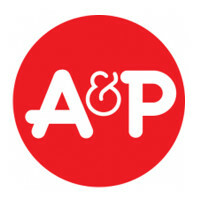 A&P Supermarket, otherwise known as The Great Atlantic and Pacific Tea Company, is a chain of supermarkets and liquor stores mainly operating in 6 states in the United States. To find out how to apply for A&P Supermarket online, follow the link below to submit an A&P Supermarket application today. The supermarkets started from a small, single coffee, tea and spice shop on Vesey Street in New York. The company was started by George Gilman who was left the premises by his father. Now there are stores in Connecticut, Delaware, Maryland, New Jersey, New York and Pennsylvania. The dedicated liquor stores are found in Connecticut, Massachusetts and New Jersey. The supermarkets brand themselves as neighborhood supermarkets selling all the typical groceries you need. Most locations also have pharmacies and offer other wellness services. There are also occasionally other services including Western Union outlets, banking services and various reward schemes. The supermarkets also generally offer online shopping and delivery services. A&P Supermarket has gone through some tough times over the years but it has survived financial crises and other issues and is still one of the most recognizable American supermarkets today. It has even been referenced in popular movies such as ‘ Born on the Fourth of July’ and in some popular songs. In their retail outlets you can always find many A&P Supermarket jobs available. The most common positions are Cashiers, Front End Customer Service Clerks, Store Co-Manager, Store Manager, Pharmacy Staff, Bakery Clerks, Grocery Clerks, Night Stock Clerks, Deli Clerk and Produce Clerk. There are many jobs in different departments. Many of these jobs are entry-level and won’t require you to have much prior experience. You can apply online for corporate roles as well if you are interested in this part of the industry. The types of openings will be in the departments of Accounting and Finance, Administration, Sales and Marketing, Human Resources, Information Technology and Merchandising among many others. For many of these careers you will need a college degree in a relevant subject. How old do you have to be to work at A&P Supermarket? You only need to be 16 years old or over to apply for jobs at A&P Supermarket. The benefits to working in A&P Supermarket careers will vary depending on your position but most Associates will become eligible for benefits after working for 90 days, provided they work a specified number of hours per week. Full-time employees will receive a health insurance package as well as a 401(k) retirement plan. The stores open at 7am daily and then close at 10pm Monday to Saturday and 9pm on Sundays. Cashier – The responsibilities in this job will be mainly to serve the customers, so good interpersonal skills are extremely important. You will need to greet and serve customers and answer any enquiries they might have. Cashiers operate the cash registers and process different types of transactions. The pay for this job is usually $7-10/hour. Night Stock Clerk – This job has some physical requirements, as you will need to be able to lift a certain amount consistently and be on your feet for most of your shift. Stockers generally work in the evenings and nights although some other hours may be required. You will restock the merchandise on the shelves. The average pay is between $8-9 an hour. Pharmacist – Most locations now have pharmacies and so you will need to assist customers with their pharmaceutical enquiries as well as fill prescriptions and give some basic medical advice. Attention to detail is very important in this role, as is the ability to multitask. The hourly pay will be around $60/hour. Store Manager – The job description for this role requires you to be able to supervise all aspects of the store at once. You will be responsible for hiring and training new employees as well as the ongoing management of the existing employees. There will also be back office administrative duties including scheduling and payroll. The salary for this job is around $77k/year. Always be prepared for interview questions by practicing some after you’ve submitted your A&P Supermarket application. Tell me about yourself. Don’t use this as an opportunity to tell your entire life story. Always stick to skills and experience you have that are relevant to the job opportunities that you are applying for. Tell me about a time when you worked in a team? If you can, it always helps to give examples from your previous employment experience to help make your point, but if you can’t then use a sports team or something from school or college. What is your biggest strength? You can talk yourself up but always keep it relevant to the skills necessary to working in the industry, it’s important that you don’t stray too far off topic. Tell me about a time when you received great customer service. When you talk about why it was so good, make sure you also tell the interviewer about how you could apply it to yourself or help others in your team. You can search for A&P Supermarket jobs online and browse all of the opportunities on the careers section of their website. You can also submit an A&P Supermarket job application online through the same website even for corporate roles. The online application form is fairly standard and easy to navigate and you can also submit multiple applications for different career paths. For store-based opportunities it is also possible to submit a direct application to your local store by heading down there in person with your resume. You can request a free application form from the manager as there isn’t an option to download a printable application for A&P Supermarket. Remember to be presentable when you meet the manager. The interview process will most likely only take a couple of weeks to complete. You may often be asked to have a brief phone interview first to ask some basic questions about you and your experience. Many stores will also require candidates to complete a background check and a drug test. Afterwards you will be invited to one or more face-to-face interviews. Remember to be well presented when you turn up because you don’t get a second chance at a good first impression. It’s important to be friendly with your interviewer, so smile and make eye contact, but also be professional. Answer their questions in complete sentences and speak clearly. Amigos United: Checkout the application page for work at Amigos United. Winco Foods: See our guide for careers at Winco Foods. Fresh & Easy: Visit the job application for Fresh & Easy to apply today. Publix: See this page for jobs at Publix. SuperValu: Visit the job application for SuperValu to apply today.